Our hotel-pension is the ideal starting point for different activities. Start you winter walk for example right away from our front door. The whole "Berchtesgadener" mountain chain and especially the mountain "Watzmann" impress through his gigantic flair. 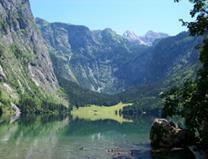 The Berchtesgaden National Park is one of the oldest protected areas in the Alps. 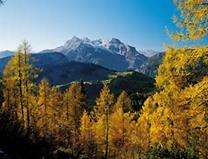 It is part of the alpine territory near the Bavarian town of Berchtesgaden in the south-east of Germany. Its amazing natural environment shows little human intervention. 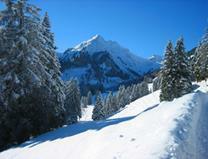 Come and visit this fascinating alpine landscape which is made up of rocks mainly consisting chalky sediments. You will get an impression of this ecological paradise either by taking part in guided tours or by going on your own tours. The landscape is mainly characterized by large areas of rocks and detritus, alpine meadows and forested areas covered with dwarf pines and alders. Your tour should definitely include a walk to the renowned lake “Königsee” which lays like a fjord between the Watzmann, the Steinerne Meer and the Hagen Mountains. The excellent drinking water quality of the Königssee shows to what extent the national park´s territory has remained untouched. For those who prefer to take it easier, endless kilometers of cleared walking trails take the hiker through some of the most spectacular landscapes in the Bavarian Alps. After hiking, mountain climbing and skiing you may want to make a stop at one of the cosy serviced mountain huts and inns which offer generous hospitality and regional cuisine.